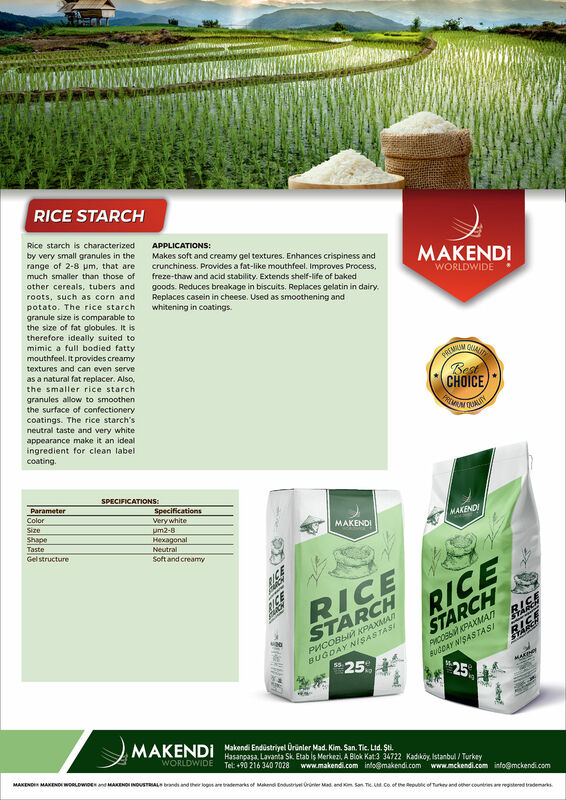 Rice starch is characterized by very small granules in the range of 2-8 µm, that are much smaller than those of other cereals, tubers and roots, such as corn and potato. The rice starch granule size is comparable to the size of fat globules. It is therefore ideally suited to mimic a full bodied fatty mouthfeel. It provides creamy textures and can even serve as a natural fat replacer. Also, the smaller rice starch granules allow to smoothen the surface of confectionery coatings. The rice starch’s neutral taste and very white appearance make it an ideal ingredient for clean label coating. Net 25 KG Paper or PP Bags. Makes soft and creamy gel textures. Enhances crispiness and crunchiness. Provides a fat-like mouthfeel. Improves Process, freze-thaw and acid stability. Extends shelf-life of baked goods. Reduces breakage in biscuits. Replaces gelatin in dairy. Replaces casein in cheese. Used as smoothening and whitening in coatings.